Photo courtesy Joel Zellers Dylan Carey proudly displays his senior project, a metal sculpture that represents his love for the Wood River Valley. The end of high school is a momentous time in so many ways, a culmination of a lifelong experience through which, it is hoped, the skills necessary to success have been learned. In Idaho, seniors go through another rite of passage, the senior project. A requirement for graduation, Senior projects were implemented at Wood River High School seven years ago. They are an in-depth, self-directed endeavor in which the student focuses on learning about and developing a new skill or talent. "It's a culmination event that demonstrates 12 years of learning through the Blaine County School District," explained Joel Zellers, a teacher at Wood River High School and a senior project advisor. "Everything they've learned from kindergarten through us, they have to demonstrate in a single class. This is where it all comes together, and is put on display so our community can see that Blaine County is producing some of the best students in the state of Idaho." The senior project also is similar in a way to work experience. "It can help solidify—or rule out—an angle they might want to take," Zellers said. "A student who might want to pursue veterinary school may shadow Mark Acker (a local vet) for a project. Basically, we ask that students learn how to do something in the process." Dylan Carey's senior project is a good example of these two requirements. Carey, 17, wanted a project that was both challenging and artistic, that combined his current skills with new skills and that would help him bring him closer to pursuing a career. He came up with welding. "He wanted to do something that could combine his CAD skills (computer-aided design) with learning a completely new skill, welding," Zellers said. Carey had watched his neighbor Aaron Taylor, an engineer at locally based goggle manufacturer ESS, welding in his garage and had thought it looked "pretty cool." 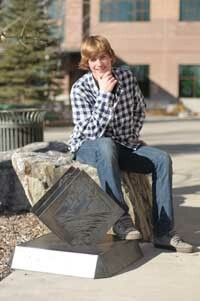 Choosing Taylor as his mentor, Carey dedicated his senior project to producing a piece of engineered, welded art. "He nailed it," Zellers said. "His final product is really amazing. Everyone who's seen it wants to buy it!" The steel sculpture combines Carey's design skills with his newfound welding know-how, plus provides a route for him to express his artistic expression. "A few years ago I'd be sitting in class doodling and drawing stuff and I drew this design that resembled the valley for me," Carey said. Incorporating the sun, the mountains and the river, the sculpture's design reflects Carey's affection for his home. "The valley means a lot to me," he said. "This piece is a good representation of this place for me, and of what I have to remember here." The project has also provided Carey with a new life skill. "This kid, no matter what he does, will always be able to fall back on welding because he's learned a new trade," Zellers said. "[The senior project] was really good for me," Carey said. "I'm very hands-on, and it was fun for me to produce something that I can keep for the rest of my life." Carey has been accepted to California Polytechnic State University in San Luis Obispo, the school Taylor attended. He is planning to study civil engineering, though since completing his senior project he has considered switching to industrial engineering. All of the Wood River High School seniors will display their senior projects to the public on Thursday, Jan. 19. See sidebar for more details. The public is invited to view all the 2012 senior projects on Thursday, Jan. 19, from 10 a.m. through 2:30 p.m. at Wood River High School, 1250 Fox Acres Rd., Hailey. Student-led independent learning is the backbone of the senior project, and it represents a capstone to the K-12 education in Blaine County. This event is an opportunity for the public to see how its tax dollars are being used to increase student learning. The school is seeking senior project panelists to review and evaluate three to four presentations. Those interested in participating should contact Julia Grafft at jgrafft@blaineschools.org.